100% Organic. Certified Organic by QAI. Considered as Dietary Supplement. Gluten Free. Peptic, Duodenal Health, Skin Care, Cardiotonic & Pro-Natural Healing. USDA Organic. Vegan. BEAUTYOILS.CO 100% Pure Sea Buckthorn Berry Oil is uniquely rich in anti-oxidants, vitamin E, phytosterols, beta-carotene, and carotenoids, making it a powerful skin repairing moisturizer. This rare oil is revered for its regenerative and nourishing properties. Known uses include promoting the healing of sun damaged skin as well as alleviating severe dry skin and eczema. BEAUTYOILS.CO 100% Pure Sea Buckthorn Oil is virgin cold-pressed to ensure optimal quality. 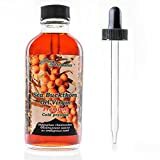 Our Sea Buckthorn Oil is reddish brown in color. Because our Sea Buckthorn Oil is virgin and unrefined, it has a strong musky scent characteristic of Sea Buckthorn. Take care when applying sea buckthorn oil undiluted as it can stain skin, clothing, and surfaces. We recommend diluting the oil if used topically to avoid staining skin. Ingredients: 100% Sea Buckthorn Berry Oil (Hippophae Rhamnoides). Sea buckthorn virgin oil Composition: Sea buckthorn oil The oil is produced of thoroughly selected berries by special technology preserving not only useful properties, but a taste of sea buckthorn. Description: Sea buckthorn Virgin Oil is produced from the Sea buckthorn (Hippophae rhamnoides). After cold pressed (without solvents) extraction and filtration the oil results in a deep red colored liquid with a pungent (but not unbearable) characteristic odor. Due to natural richness in vitamins, essential fatty acids, and nutrients, Seabuckthorn Virgin Oil is known to be unique nutritional supplement. It can help heal cuts and burns, wounds and sunburns, rashes and other types of skin problems. It is a great natural cleanser and its daily use helps slow down the signs of aging by nourishing the tissues in our skin. Sea buckthorn contains high amounts of vitamins (A, C, E), fiber and protein. It has 15 times more vitamin C than oranges. The fruit also is rich in carotenoids, amino acids, dietary minerals and polyphenols. Sea buckthorn oil is considered to have high antioxidant as well as antiviral and anti-inflammatory properties that help promote whole body health. Sea buckthorn oil can be taken internally as a dietary supplement or used topically. As a dietary supplement, take 1 teaspoon 2-3 times daily. Warnings: Keep out of reach of children. Avoid contact with eyes. If pregnant or lactating, consult a health professional before use.